GUEST: It's been in my family for probably more than 70 years. My grandfather bought it in Maryland, along with some other military items, mostly Civil War-- letters, a sword—and he bought it in the '30s, so I probably have had this drum, maybe, going on 40 years. APPRAISER: Okay. So he was a very early collector. GUEST: Yes, he loved history. APPRAISER: It's called a regimental drum. You have this nice kind of iconic, folky, American eagle on here. It's the type of thing that a collector really loves, with its wonderful colors and paint. You'll see where it says R-E-G for "regiment," and then it goes on and it says "infantry." APPRAISER: And, sometimes, they could actually paint the number of the regiment in front of this R-E-G. But we do know the regiment that this drum was in because after the war, the owner took the time to write down his full name, the regiment he was in and the battles that he fought in. This is a really unique aspect. And it's something that collectors enjoy because it takes this away from just being an object and it actually puts it in a place, and it puts it in a person's hands, so we can really kind of get our fingers around it and understand it. And that's what collectors love. It says: "Through The Civil War, Justus N. Williams." APPRAISER: He shows this date of enlistment and the date he's discharged. He lists his regiment-- he's in Company F of the 122nd New York State Volunteers, and he's in the Second Division of the Sixth Corps. APPRAISER: You have to imagine this is probably a very young man, he's carrying this drum, and he comes and he says "Under fire in..." And that means he's actually in the thick of battle with his friends, his brothers, the people that he lives with. They become almost like a family to him. One of the really great aspects is he is at the three pivotal days in the American Civil War. He's at the Battle of Antietam, which is the bloodiest day in American military history. He is at the Battle of Gettysburg, which is the high watermark for the Confederacy. It's the true beginning of the end. APPRAISER: And then he's at Appomattox, when it's all summed up and the war's over and it's come to a close. He's playing a part in these things that are happening in our country's history and then, after the war, he's taken it and written it all down, so it tells us a story. APPRAISER: And that's what a collector likes. It's in its original untouched condition. That's a big thing for a collector, too. We have all the original paint; the ropes are original, the leathers are original. That's something that a collector looks for. I think, retail, this drum is probably worth somewhere between $8,000 and $9,000. APPRAISER: No, it's a nice drum, and it's the history that really drives the value. APPRAISER: If it did not have that writing, then you would be thinking more along $4,500. J. Christopher Mitchell (Daphne, Alabama) is one of the nation's leading arms and militaria authorities. His areas of expertise in American and foreign military items span more than three centuries, from 1600 to 1945. Mr. Mitchell has purchased military artifacts belonging to some of America's greatest heroes, including Presidents Lincoln, Jefferson, Monroe, Adams, and Madison, and Confederate General Robert E. Lee, as well as many others. He holds a bachelor of arts degree in history from Springhill College in Mobile, Alabama, and has also completed the core requirement courses for the International Society of Appraisers. A consultant to auction houses, museums, and the nation's leading collectors of militaria from all wars, Mr. Mitchell is noted for his unique passion for American antique militaria, and highly regarded for his more than 25 years of experience and extensive knowledge of the period from the American Revolution through the American Civil War. He specializes in Colt pistols, Civil War presentation pieces, and Confederate items, which he also collects. Mr. Mitchell is an active member of several antique military organizations, including the Southeastern Antique Arms Collector Association, the Pennsylvania Antique Gun Collectors Association, and the Alabama Gun Collectors Association, and is also a lifetime member of the Antique Bowie Knife Association. His numerous lectures and television appearances include nine seasons of participation as an appraiser on the highly acclaimed Antiques Roadshow. He is currently conducting research for a book about historical weapons of the American military, as well as writing articles for the Antiques Roadshow Insider newsletter. Organized at Syracuse, N. Y., and mustered in August 28, 1862. Left State for Washington, D. C., August 31, 1862. Attached to 3rd Brigade, 1st Division, 4th Army Corps, Army of the Potomac, to September, 1862. 2nd Brigade, 3rd Division, 6th Army Corps, to October, 1862. 1st Brigade, 3rd Division, 6th Army Corps, to January, 1864. Johnson's Island, Ohio, to March, 1864. 4th Brigade, 1st Division, 6th Army Corps, to July, 1864. 3rd Brigade, 2nd Division, 6th Army Corps, Army of the Potomac and Army of the Shenandoah, to June, 1865. SERVICE.-Maryland Campaign September 6-22, 1862. Battle of Antietam, Md., September 16-17. Duty in Maryland till October 20. Moved to Stafford Court House, Va., October 20-November 18, and to Belle Plains December 5. Battle of Fredericksburg, Va., December 12-15. At Falmouth, Va., till April, 1863. "Mud March" January 20-24. Chancellorsville Campaign April 27-May 6. Operations at Franklin's Crossing April 29-May 2. Battle of Maryes Heights, Fredericksburg, May 3. Salem Heights May 3-4. Banks' FordMay 4. Gettysburg (Pa.) Campaign June 11-July 24. Battle of Gettysburg July 2-4. Pursuit of Lee to Manassas Gap, Va., July 5-24. Duty on line of the Rappanannock and Rapidan till October. Bristoe Campaign October 9-22. Advance to line of the Rappahannock November 7-8. Rappahannock Station November 7. Mine Run Campaign November 26-December 2. Duty at and near Brandy Station till January, 1864. On detached duty at Johnson's Island, Lake Erie, till March. Campaign from the Rapidan to the James May 3-June 15. Battles of the Wilderness May 5-7; Spottsylvania May 8-12; Spottsylvania Court House May 12-21. Assault on the Salient, "Bloody Angle," May 12. North Anna River May 23-26. On line of the Pamunkey May 26-28. Totopotomoy May 28-31. Cold Harbor June 1-12. Before Petersburg June 17-18. Jerusalem Plank Road, Weldon Railroad, June 22-23. Siege of Petersburg till July 9. Moved to Washington, D. C., July 9-11. Repulse of Early's attack on Fort Stevens and the Northern Defences of Washington July 11-12. Expedition to Snicker's Gap, Va., July 14-23. Sheridan's Shenandoah Valley Campaign August 7-November 28. Gilbert's Ford, Opequan Creek, September 13. Battle of Winchester September 19. Fisher's Hill September 22. Battle of Cedar Creek October 19. Duty in the Shenandoah Valley till December. Moved to Petersburg, Va., December 9-12. Siege of Petersburg December 12, 1864, to April 2, 1865. Fort Fisher, Petersburg, March 25. Appomattox Campaign March 28-April 9. Assault on and fall of Petersburg April 2. Sailor's Creek April 6. Appomattox Court House April 9. Surrender of Lee and his army. At Farmville and Burkesville till April 23. March to Danville, Va., April 23-27, and duty there till May 24. March to Richmond, thence to Washington, D. C., May 24-June 3. Corps Review June 8. Mustered out June 28, 1865. GUEST: I brought this Civil War drum. It's from my great-grandfather, from the Rhode Island area, and a certificate that shows that he was actually the drummer in the Civil War. APPRAISER: Right. And, if you notice, it mentions that he is a drummer of Company L in the Ninth Regiment of Rhode Island Infantry. And it's an interesting regiment that he was in. The Ninth was raised because they were afraid that Washington, D.C., would be occupied by the Confederacy. In May of 1862, General Stonewall Jackson had had decisive battle victories at Winchester and in the Shenandoah Valley. The next step, they were right at Washington, D.C. And so President Lincoln says, "We've got to have regiments to defend the city." He sends a letter to the governor of Rhode Island, and they call up the Ninth Infantry. They're sent there to guard Washington, D.C. And if you notice, the drum also has the matching Ninth Regiment, "RI" for Rhode Island Infantry, and Company L. It has everything on it that you would expect. They were only in service for three months, which is why the drum is in such beautiful condition as far as the paint. It has bright colors. It's a beautiful drum. The heads do come off. It's in need of some restoration. APPRAISER: If you notice right here, we have the maker's label-- from Horsman of Philadelphia, one of the premier makers during the Civil War. They made things, and they also retailed items for military use. We have both of the original heads. All we're missing is, basically, the tension ropes. We have the snare on the bottom. The discharge... Has it been in the family the whole time? GUEST: Yeah. Actually, I was going through a trunk, finding things to maybe bring, and I found this only, like, a week ago. GUEST: And connected it to the drum. APPRAISER: That's great, because it mentions in there that he is a drummer boy in the discharge. The discharges you do encounter, because every Union soldier that survived would have gotten one, and that was their ticket, in later years, to be able to draw a pension. APPRAISER: A lot of drums were surplus, meaning they never saw service. And they'll actually come out, and you won't have the regiment, you won't have the state, and you won't have the company. They would paint the basic drum, and then, once it made it into the field, the drummer boy himself, or somebody in the regiment, would add that information on it. Which personalizes the drum, so it's not only do we have his discharge, we've got his input on the drum. And it brings everything together. APPRAISER: It's a fantastic piece. I can tell by that look in your eye it's something you'd never part with. APPRAISER: So what we'd be looking for is an insurance appraisal. APPRAISER: Right. And, on a discharge, most of the time they're $100 to $200. The drum itself would need to be insured for $7,500. Rafael Eledge is one of the country's most active and knowledgeable experts of Civil War and 19th-century militaria. Mr. Eledge's career began at the ripe age of 11, when he received his first metal detector and began searching around his home state of Tennessee for Civil War artifacts. He continued to gain knowledge and expertise as he attended trade shows, buying and selling pieces to support himself through college. After graduation, Mr. Eledge fulfilled his childhood dream of owning a Civil War relic shop and museum. Shiloh Civil War Relics was opened in 1995 just to the north of the main entrance to Shiloh National Military Park in west Tennessee. Shortly thereafter, Shiloh Relics Online was born, and Mr. Eledge moved military antiques and arms collecting into the 21st century. Today the business is a 2,400-square-foot retail shop and one of the Internet's most visited Civil War Web sites. Shiloh Relics has active inventory that rivals some of the nation's best museums. Even though Mr. Eledge's knowledge covers all aspects of pre-1900 militaria, his current passion is Civil War cannons, implements and ammunition. Having owned 15 original Civil War cannons and more than 1,000 projectiles, he is currently in the process of developing a manuscript on cannons used in the Battle of Shiloh during the American Civil War. Aside from his dedication to his business and family, he is also concerned with the preservation of our nation's artifacts and supports many such efforts. GUEST: I know that it came from the Kentucky-Tennessee area and that it was given to me by a friend, and it was given to him by an uncle around 1950. That's all I know. APPRAISER: It was the presidential campaign drum. It's from the campaign of Zachary Taylor and Lewis Cass of 1848. It's really rare. It's 155 years old, and it's survived beautifully. And you can see the stars, 13 stars, and an American eagle. And Zachary Taylor was an officer, a hero, during the Mexican War. "Rough and ready" was his slogan then, and he ran a presidential campaign with that slogan. APPRAISER: Later drums had little iron attachments for the ropes, and a drum of this period has holes, and the ropes went through the holes. And these tightened the drum. These are leather tighteners, and these are the original hand-carved wooden drumsticks, and it's wonderful that they stayed with the drum. GUEST: You know, actually, if you can see this paint right here, we actually have used those to stir paint with and then kind of thought about it and then cleaned them off. APPRAISER: Well, don't stir paint with them anymore. It really survived in great shape. If I had this drum, I think I'd want between $10,000 and $15,000 for it. APPRAISER: Well, you know, it's very historically important. GUEST: Would these be original ropes on here? APPRAISER: They could have been replaced. GUEST: Could have been replaced, okay. APPRAISER: But they're old. They've been there a long time. GUEST: I saw you looking in this hole. APPRAISER: --the air came out that hole. But opposite that hole would have been the maker's label, and you can see where it was, but it's long gone. So even looking like this, this is great condition. APPRAISER: I wouldn't touch it. APPRAISER: It's a wonderful, wonderful memento. GUEST: Thank you so much. Ed. Note: Inspired, clean, crisp and the ultimate authentic old school drum & bugle corps. That's all I could think of when I heard the U.S.M.A. 's Hellcats last Saturday night playing in the Old Guard's 50th Anniversary Tatto (yet to hit YouTube but available on the OG's website as Part 1 and Part 2). So, I decided that the material on the Hellcats' website should be here for blog viewers to read. For free recordings of The Hellcats (mp3), visit the website. Since the earliest days of the American Revolution, commanders of the Continental militia realized the importance field musicians held in the order, morale and discipline of their troops. The practice of mustering a fifer and drummer into each company began with the earliest regiments of the Revolution and continued through the end of the Civil War. In camp, the sounds of the fife and drum regulated the daily activities of soldiers using a set series of daily duty calls. By commands of music, soldiers were notified when to wake, drill and eat, when to collect wood or water and when to go to bed at night. 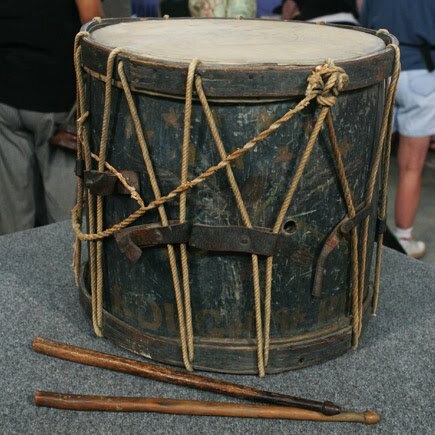 The drum served as the primary source of battlefield communication between an officer and his men on the field. Additionally, the steady beat of the drums together with the fifes kept soldier morale high by providing lively tunes on the march. The fife and drum predominated until after the Civil War, but bugles sounded signals in some units as early as Revolutionary times. Easily played with one hand, the bugle became the unofficial instrument of the cavalry. The bugle served an increasingly important role later in the 1800's as the introduction of rapid-fire weapons and larger caliber artillery made the drum a less effective instrument for signaling. Army field commanders grew more dependent on the bugle's bold brilliant sound to relay commands both in camp and over the din of battle. 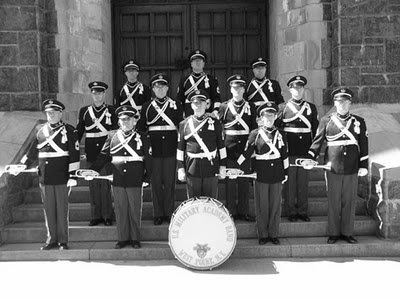 The Hellcats field music group at West Point has a heritage that dates back to those Continental fifers and drummers. Their legend began early in the American Revolution, when elements of General Samuel Holden Parsons' brigade, including fifers and drummers, crossed the frozen Hudson River to establish the garrison of West Point in January of 1778. This field music connection gives the Military Academy Band the distinction of being the oldest active band in the U.S. Army and the oldest unit at West Point. Within a few years of those first few field musicians arriving at West Point, inspection records show there were literally hundreds of fifers and drummers on site. Following the Revolution, troops were mustered out and there remained “fifty-five men at West Point” including one fife and one drum. With the establishment of the Academy in 1802 came an increased demand for military music. As the Academy grew, it needed fifers, drummers and buglers to drill the new cadets and provide an audible order to their duty day. Throughout the 1800's there seems to be an average of fifteen field musicians on site at any one time. “Drummer boys” were still being used in field music to play all the cadet calls until around 1880. Keyed bugles were the original brass band instruments and were introduced to the U.S. from Europe by West Point's bandmaster Richard Willis. The band's first bugler, Frederick Lewis, arrived in 1815 and served until 1821. By 1853, the Academy Band was using two assigned buglers to perform cadet calls. Complicating the matter, attached cavalry buglers (such as Louis Benz) were used for United States Corps of Cadet duty. This “Duty Bugler” position remained active until 1942 when it was eliminated and the company bugler duties were transferred to the Hellcats. 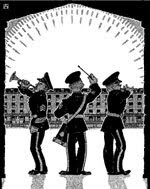 The field music bugles do not appear to have been used in massed formations until perhaps WWI. By 1918, records show the field music instrumentation included fifes, drums and bugles with a strength of twenty-nine men. This basic configuration would remain the field music standard through the end of WWII. At the end of WWII, band strength was in a free fall as “end of war” discharges and a general reduction in force continued to remove personnel. 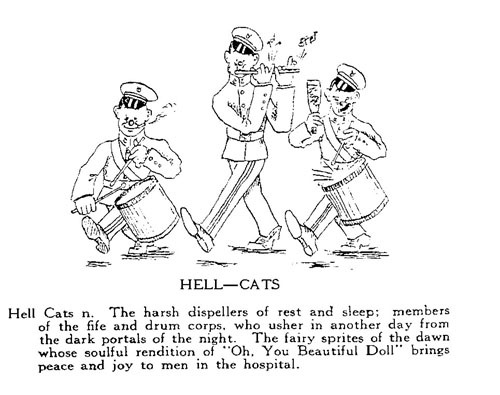 By 1946 all that remained of the Hellcats was three drummers and two buglers. Field music support for reveille and meal formations was halted indefinitely and could not resume until 1949 when field music regained sufficient strength. Through the 1950's and 60's, modern Hellcat techniques began to develop. As young men with new visions moved into leadership positions, the Hellcats took on a new look and sound. Captain Resta, the Commander of the USMA Band in 1953, asked a young Sergeant Richard Pelletier if he could turn the Hellcats into something special. The answer was “yes” and with matching drum parts penned by Sergeant Jack Pratt, Pelletier researched, compiled, wrote and arranged bugle tunes at a dizzying pace. With improved techniques, higher standards and a library of groundbreaking original arrangements, the group began transforming into what would become a truly distinctive “showcase unit.” By 1972, The Hellcats reached an all time high of sixty-one men and became a fully autonomous group consisting of bugles, drums, piccolos, tenor drums and a Scotch bass drum. The group now had its own drum major, NCOIC and three Section Leaders. A major reduction hit the USMA Band in 1974 and changed the Hellcats forever. Within a one-year span, field music was reduced to nine buglers and seven drummers and had completely lost its piccolo section. A second cut in 1993 brought the group to its current authorized strength of six bugles and four drums. The importance of field musicians has waxed and waned with the ever changing needs and requirements of the U.S. Army. But today at West Point, their need is just as great as ever and the Hellcats proudly perform their duty as the last functioning field music group in the United States Army. It is still the mission of today’s Hellcats to provide daily musical support to the United States Corps of Cadets. In addition to sounding Reveille, Retreat and To The Color each day at the garrison flagpole, the Hellcats play for cadet drills, military reviews and parades. Each weekday they provide a diverse selection of lively tunes as the cadets march into the mess hall. The Cadets of West Point have a definite love/hate relationship with the field music group. It has been said, one winter night members of the cadet class of 1833 captured all the fifes and drums used for reveille, tied them to the halyard and ran them up the flagpole. 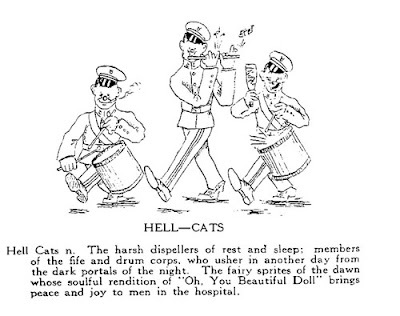 Since early in the twentieth century, the West Point Cadets have affectionately referred to the field music group as “The Hellcats” because that is exactly what they sounded like at reveille. Many reunion classes request the Hellcats to perform for their class parties. Many old grads laugh and cheer, some wipe away tears and smile at that memorable sound from long ago. There is always one who relates how much the Hellcats were hated by the cadets back then, but how fondly they are remembered after a few years absence. Hellcat buglers and drummers also have the sad task of performing muffled drum rolls and Taps for West Point funerals. 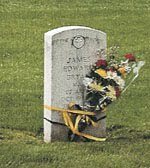 We are ever aware of General Daniel Butterfield's role in the writing of the bugle call Taps as he closely attends each sad ceremony with his presence in the West Point cemetery. The field music drummers had been playing traditional rope tension drums at West Point since the Revolution. This continued unchanged until the late 1930s when rod tension drums first appeared in the band at West Point. Rope drums reappeared in 1965 as a new set were purchased from the Gretsch Drum Company for use on special occasions. The tradition of rope tension drums returned full time to West Point in 1990 when the Cooperman Fife and Drum Company produced a set of custom rope tension drums. These drums are used for parades and shows while the old Gretsch are still serving faithfully as the every-day work drums. Around 1933, the fifes were totally dropped due to pitch problems but were shortly replaced by piccolos that blended much better with the bugle. The standard army issue bugles became chrome plated in 1923 making them unique to West Point. From 1932 forward, custom chromed bugles with one valve in Bb/F became the new standard field music horn. Around 1946 new single valve Bb/F bugles designed by Vincent Bach were doing duty at West Point followed in the 1960s by a set of bugles produced by Donald E. Getzen. In 1998 the newest set of custom bugles made their debut at West Point. Mr. Clifford Blackburn of Blackburn Trumpets made improvements on the old design, creating new horns that play freely throughout the entire register, while retaining a dark, characteristic bugle sound. With this new line of custom-made instruments in their hands, the Hellcats continue the legacy of musical tradition at the Academy with an improved level of excellence. Pride, intense esprit de corps and a sense of historical continuity inspire the distinguished service of today's Hellcats. With their precise marching, embellished by the twirls of silver bugles and intricate rudimental drumming, the group delights many thousands of spectators each year. The Hellcats function as a completely independent group with a full show package and are capable of adapting their production to any performance venue. In 1994, the Hellcats were honored to participate in the deactivation parade of the Allied Strike Force as it made its final departure from the city of Berlin. The Hellcats have been featured on every major television network morning show and they have been warmly received at military tattoos in Atlanta, Georgia and Hamilton, Ontario. In 2002 the group was invited by Skitch Henderson to perform in Carnegie Hall with the New York Pops Orchestra. The Hellcats also were requested by Keith Lockhart and the Boston Pops Orchestra to spice up the 1812 Overture in their Fourth of July celebration at the Hatch Shell. The Hellcats of the twenty-first century are staffed by highly talented musicians, professionally trained and equipped with custom instruments designed and hand-made specifically for them. 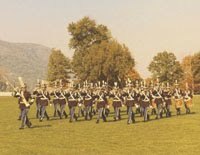 Today's Hellcats enable the United States Military Academy Band to maintain faithful renditions of traditional American military music and to daily provide the Corps of Cadets with a unique piece of living history. 1) 0630: Salute cannon/Reveille: A busy day at the Military Academy begins before dawn. At the flagpole, the cannon fires and the flag rises to the strains of Reveille. While most army posts perform this ceremony to a recorded bugle call, at West Point it is still performed live each morning by Hellcat buglers. Once this bombastic alarm clock has sounded, cadets spring to action to get washed, dressed and straighten up their rooms, for in less than thirty minutes they are expected to fall in for accountability and breakfast formation. 2) 0700: Breakfast formation: The Reveille Routine has gone through many incarnations over the years. In earlier times, this set of tunes was played by piccolo, bugle and drum as the cadets formed up. The tunes were carefully programmed and timed to coincide with a series of bells letting the cadets know how much time remained before Assembly. Traditionally, new cadets (Plebes) would fall in early to be drilled by upperclassmen on cadet knowledge. In recent years the bells and piccolos have been eliminated, but the bugles and drums still carry on the tradition each morning using these same tunes to march the cadets into the mess hall. 3-4) 0900: Hellcat Show: Mornings are spent in rehearsal preparing for performances on the road. Many mornings the group is out performing their show for veteran's groups, civic activities or school audiences. 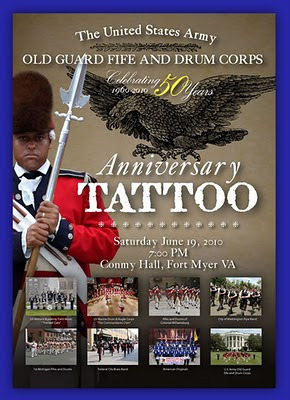 Segments of this show have been performed around the world, on major television networks, at international tattoos and on stage with such groups as the New York Pops and Boston Pops orchestras. 5) 1200: Morning classes behind them, the cadets form up once again for dinner formation. Presented here is a sample of typical bugle tunes and drum cadences used daily to march the corps into the mess hall. This same format is used for supper formation in summer months for support of the new cadets in beast barracks. 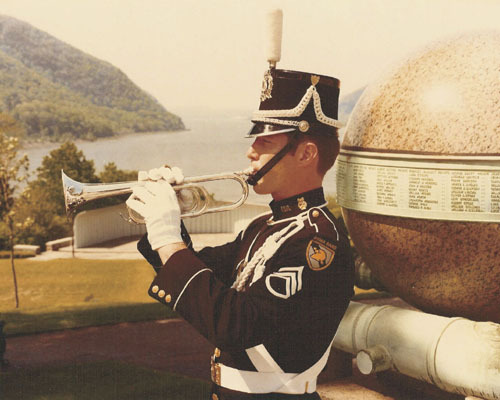 6) 1400: Funeral: A West Point grad gets his final tribute from a grateful nation at West Point from the Hellcats as the muffled drum rolls and the lone bugler plays Taps. In addition to on post funerals, Hellcat buglers log thousands of miles each year performing final honors for hundreds of veterans throughout the New York/New Jersey area. 7) 1700: Most afternoons the cadets are drilled around the Plain by a team of Hellcat drummers, but pomp and ceremony are in order, as the cadets take to the parade field in full dress uniform for a review on the Plain. We present a modified parade including the bugle calls Retreat and To The Color as the flag is lowered. This track features Field Music bugles and drums augmented by piccolo players from the concert band re-creating the old Hellcat’s instrumentation. 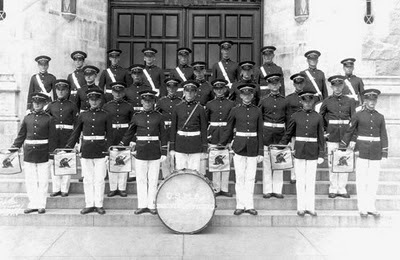 8-12) 1930: The Military Academy Band has a unique resource in the Hellcats. An evening concert at Trophy Point often features traditional marches and special arrangements written especially for the band to showcase the Hellcats and highlight their unique contribution to the ensemble. 13) 2300: Lights Out: Day is done, time for lights out as the bugle sounds Tattoo. •The United States Marine Drum and Bugle Corps - Washington, D.C.
•City of Washington Pipe Band - Washington, D.C.
You'll need to have Apple Quicktime running (download here).